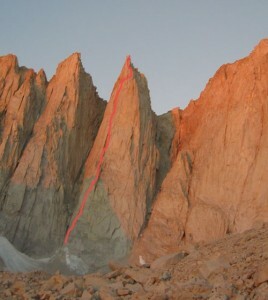 At first glance, the Harding Route appears to be the perfect alpine rock climb. Unfortunately, the climbing starts out mildly loose, rotten, and dirty, and mostly stays that way to the summit. We're not talking horrendous and dangerous loose rock, just not the near-perfect Sierra granite on most other routes in this book. That said, climbers still lust after aften Keeler Needle. It's big, stout, and guarantees a memorable adventure. And, let's face it, it's a big prize that carries a certain amount of bragging rights. This climb is a step up in difficulty from Southwest Face of Mt. Conness. Which SuperTopo guidebooks include a topo for Harding Route?